Our beautiful wall hanging glass patent Plaques feature either our traditional or contemporary series presentation plate designs. 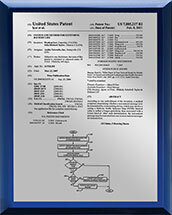 Your patent information is reproduced on the presentation plate in amazing detail. The presentation plates come in silver or gold and are mounted on a polished glass patent plaque which features 45° beveled edges. 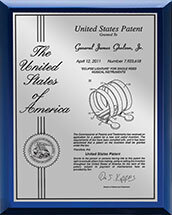 These patent plaque awards feature a mounting block with keyhole on the back of the plaque for easy wall hanging. Please keep in mind that all of our patent plaques are custom-made, so if you don't see what you are looking for please contact one of our IP Award Specialists and see how we can help you.